Call it a hunch, but we knew that Lizz Wasserman, the designer behind Popomomo, had a quirky sense of style long before we laid eyes on her closet. Short for “post-postmodern movement,” the eco-chic label was a response to the unchecked consumerism Wasserman witnessed while designing for Urban Outfitters and Free People. Her labor of love is meant to be the antithesis of disposable fashion, with pieces that are not based on trends but can be worn for seasons to come. Above, Wasserman wears a vintage silk top she dyed herself, along with a bubble skirt made from a vintage skirt and a tank top. “I have a lot of these experiments that just don’t make it to the Popomomo line,” she tells Ecouterre. I have lived with my boyfriend—soon-to-be husband—for about nine years, and this is the first apartment that we’ve shared a closet. So we share a crazy, cramped closet. As a designer, I’ve always “collected” clothing for inspiration, for pattern, for detail, or just because it’s awesome. 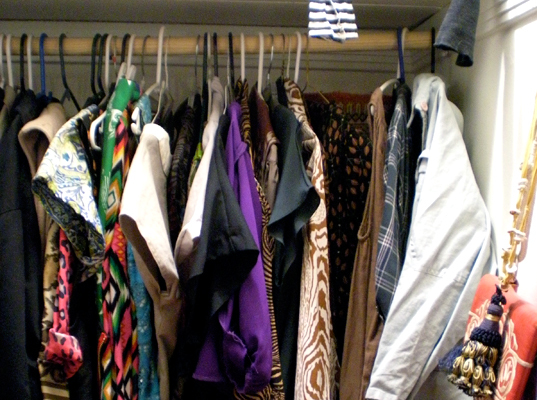 But when we moved from Brooklyn to L.A., I really purged a lot of my closet. I stopped buying things just because they were great in general and started thinking more about if they were right for me. 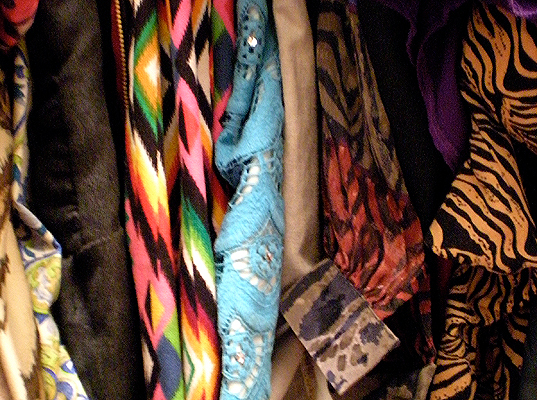 In my closet, I have a ton of pattern—mostly vintage graphic and ethnic pieces, and Popomomo pieces. I can’t wait to start doing allover prints for Popomomo. I have a ton of “ethnic” vintage collected from all over the world and all over America. I always get inspired by traditional crafts; I think that’s why I liked designing for Free People so much. 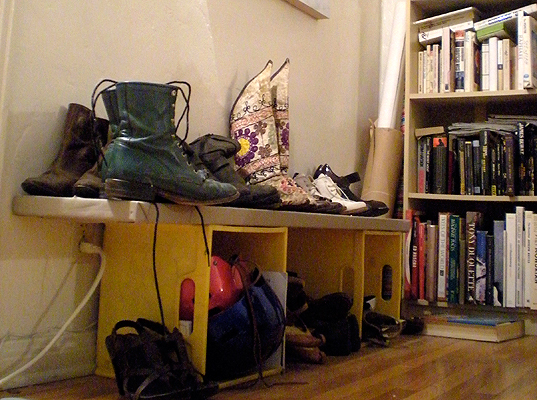 One other thing about sharing a closet: My shoes have spilled out of the bedroom into the living room. LEFT: This is my favorite fall dress from Popomomo. I’m excited to layer it over my turtleneck dress when it gets cold enough. 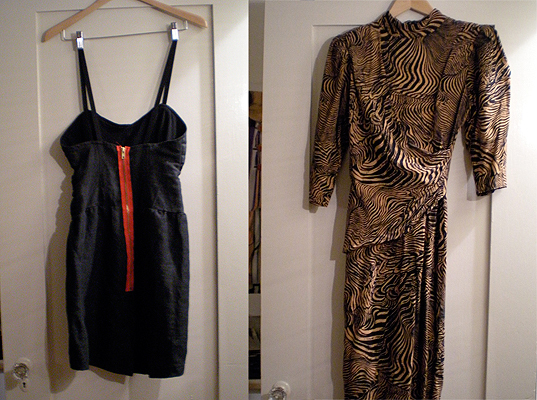 RIGHT: This is my new favorite vintage dress. I love the crazy print, the draped sash, the dramatic shoulders, and the sleeve length. Perfect! 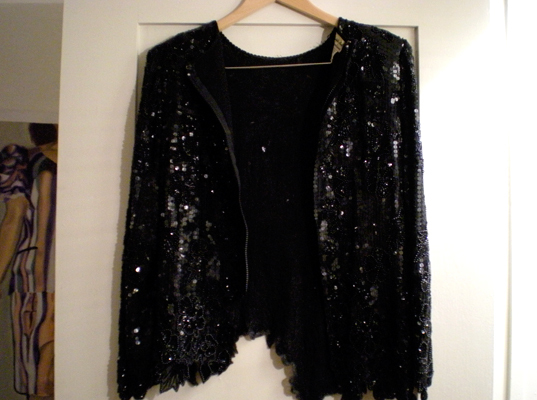 I made my favorite fall jacket out of a big sequinned dress I found at the thrift store. I just flipped it around, changed the zipper, and cut the bottom with the sequinned pattern to be gradual and uneven. I wear this way too often, to places that are maybe inappropriate for sequins. I wear this way too often, to places that are maybe inappropriate for sequins: going grocery shopping, walking my dog, etc. It’s just fun. This is what I wore to my bridal shower. It’s remade vintage (but I traded for it at a flea market). I’m with my friend Xana and we both thought we looked a little “Mafia,” especially together. 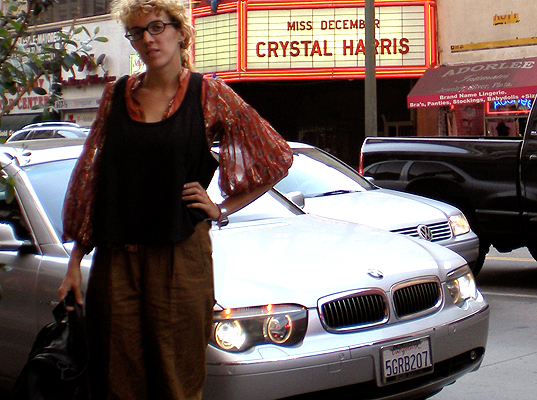 Here, I’m standing outside the Lost Angeles where I’ll show the Spring/Summer 2010 line for L.A. Fashion Week. I think I look like a Russian Cossack, which is kinda awesome. I’m wearing a ton of clothing because I was at my studio digging through old bins and just kept throwing on more stuff: an oversized vintage cropped tank, a luxury bohemian-type top I bought in Taipei, a wifebeater I spray-painted, and these highwaisted vintage pleated pants, with my old buckle boots. I think I look like a Russian Cossack, which is kinda awesome. Last Friday, I went to a friend’s photography opening with my friend Anne. I’m wearing a dress from my new curatorial line: It’s made out of vintage fabric. I’m also wearing my favorite crocheted socks (I bought them in Japan when I was there for work) with vintage leather boots I just found. I have a separate dresser for hosiery hidden in the back of our shared closet, so I guess I haven’t really cut back on extra stuff that much. Call it a hunch, but we knew that Lizz Wasserman, the designer behind Popomomo, had a quirky sense of style long before we laid eyes on her closet. Short for "post-postmodern movement," the eco-chic label was a response to the unchecked consumerism Wasserman witnessed while designing for Urban Outfitters and Free People. Her labor of love is meant to be the antithesis of disposable fashion, with pieces that are not based on trends but can be worn for seasons to come. Above, Wasserman wears a vintage silk top she dyed herself, along with a bubble skirt made from a vintage skirt and a tank top. "I have a lot of these experiments that just don't make it to the Popomomo line," she tells Ecouterre.